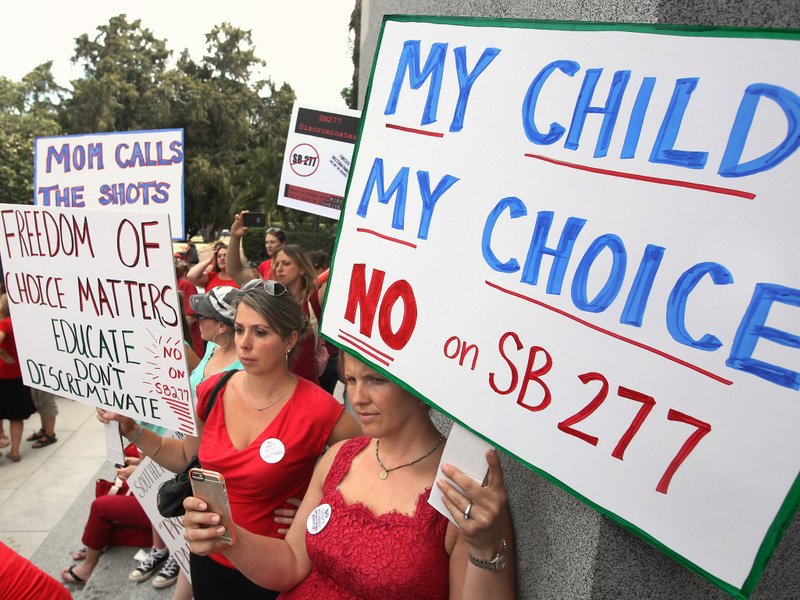 Parents rally against SB 277, a California measure requiring schoolchildren to get vaccinated, outside the Capitol in Sacramento, Calif. Opponents of mandatory vaccination have started collecting petition signatures for a referendum that would appear on the November 2016 ballot. Election analysts say voters are more inclined to vote "No" on referenda - no matter the question -, which means the vaccination bill's future could be vulnerable. Will voters be confused by this referendum? How much lobbying power and campaign financing does it take to get voters to punch "Yes?" Should governance of initiatives and referenda be reformed? If lawmakers, representing the people, pass a new bill, but special interest groups want to see its undoing, should a referendum instead ask voters to veto it (vote “No”) in order for the bill to die? Will Donald Trump revisit discredited vaccine/autism theory? California kindergarteners are receiving fewer vaccines — why?